GUANTANAMO BAY NAVAL BASE, Cuba A U.S. military war tribunal is weighing a question that might seem better suited for a history class than a courtroom: How long has the United States been at war? 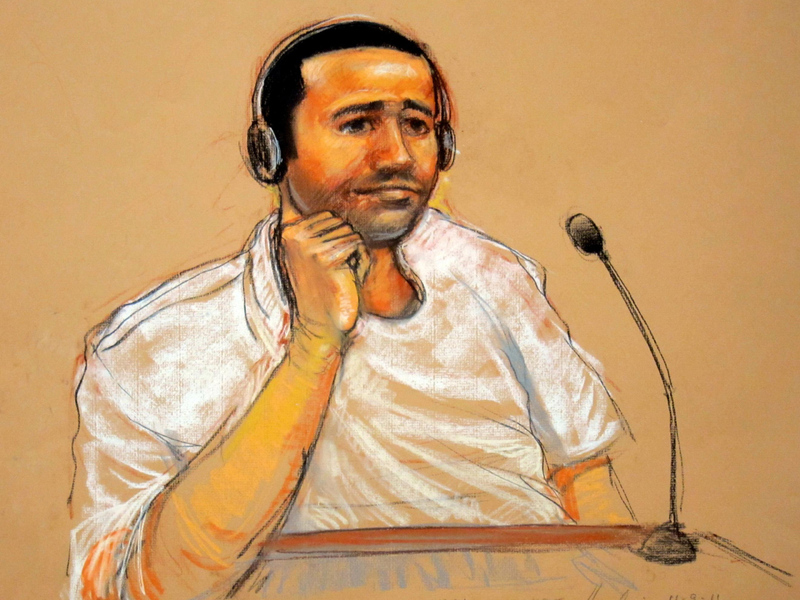 The question is more than academic for Abd al-Rahim al-Nashiri, whose lawyers are appearing before the tribunal this week at the U.S. base in Guantanamo, Cuba, to seek the dismissal of war crimes charges that were approved by a Pentagon-appointed legal official. Al-Nashiri faces trial in a special tribunal for war-time offenses known as a military commission for allegedly orchestrating the bombing of the USS Cole in Yemen in 2000 as well as attacks on two other ships. But his lawyers say that since the U.S. wasn't at war at that time, the 47-year-old shouldn't be tried at Guantanamo. "The fact of going to war is a decision by the political branches, either Congress or the president or both," attorney Richard Kammen said Monday. "It's not something to be arrived at retroactively by a bureaucrat who is not appointed by Congress because it has huge consequences." Al-Nashiri's lawyers say that the U.S. wasn't at war until after the Sept. 11, 2001, attacks and then-President George W. Bush did not certify the existence of hostilities of any kind in Yemen until September 2003. The motion for dismissal is one of 21 matters set for consideration at a hearing that started Tuesday at the base, where the U.S. holds 166 prisoners, most of whom have not been charged with any crime. The hearing is scheduled to run through Thursday but officials were trying to condense the agenda because of the approach of Tropical Storm Sandy, which was heading north in the Caribbean Sea on a track to reach southeastern Cuba on Thursday. Al-Nashiri refused to attend the hearing, telling a legal official at the prison that he was boycotting to protest the use of belly chains to move him from his cell to court. The chief prosecutor, Army Gen. Mark Martins, argued that he should be required to attend at least so that he can be questioned about his motivations in open court in case the matter is ever reviewed in later appeals. The judge, Army Col. James Pohl, has previously said al-Nashiri can waive his right to attend pretrial hearing, as he did last week in the Sept. 11 case. Lawyers for al-Nashiri have said he opposes restraints that remind him of the harsh treatment he endured previously in U.S. custody as well as because he feels the proceedings are pointless since the government could detain him indefinitely even if he were acquitted. "If he is acquitted he does life without parole in Guantanamo. If he's convicted he gets life without parole or death in Guantanamo," Kammen said. "It's very easy to see somebody saying 'Why do I want to participate in this? I've got no real stake in the outcome.'" Other items on this week's agenda include whether the U.S. government should turn over information about a man killed in a drone strike in Yemen in 2002 who was identified in some media reports as the mastermind of the Cole attack. "If he was killed based on the fact that he was the mastermind behind the USS Cole that's relevant," said Navy Lt. Cmdr. Stephen Reyes, his military lawyer. Al-Nashiri, who was born in Saudi Arabia to a Yemeni father and a Saudi mother, has been held at Guantanamo since September 2006. An allegedly senior member of al Qaeda, he was held for four years in the CIA's secret network of overseas prisons, where he was subjected to the "enhanced" interrogation program that included at least two instances of the simulated drowning technique known as waterboarding. The government has said he was also threatened with a gun and a power drill because interrogators believed he was withholding information about possible attacks against the U.S. In November, he was arraigned on charges that include terrorism and murder for the attack on the Cole, which killed 17 sailors and wounded 37, as well as for orchestrating the October 2002 bombing of the French tanker MV Limburg, which killed one crewman, and a failed January 2000 plot on the USS The Sullivans. He could get the death penalty at a trial that his lawyers say is at least a year away. In making the case for the military tribunal, prosecutors lay out the history of what they see as al Qaeda's escalating war against the U.S., starting with an August 1996 declaration by Osama bin Laden calling for the murder of U.S. personnel serving on the Arabian peninsula, though it wasn't until a week after the Sept. 11, 2001, terrorist attacks that Congress and Bush approved an authorization for military force. Al-Nashiri's lawyers say that former President Bill Clinton repeatedly noted that the country was at peace in the aftermath of the Cole attack. A group of retired admirals and generals who served as senior military legal officials called for the military charges to be dismissed and for the case to be shifted to a civilian criminal court. In a brief in October as part of a civil challenge to the case, they also argued that the definition of war was being improperly expanded to include non-war offenses in the al-Nashiri case, and that such a use of the military courts could put U.S. soldiers and citizens in jeopardy in the future if other countries did the same thing to them. "If countries can retroactively decide we were at war and chuck people from the civilian court systems into prisoner of war systems with the attendant lack of protections, that road runs both ways," Kammen said. "Once you get to go back in time and rewrite history that's a very, very dangerous precedent." Prosecutors say in court papers that it will be up to the jury to decide whether the war crimes were properly filed in this case, and that it's too early for the judge to rule on the question. The judge is not expected to issue an immediate ruling on the motion.